If annoying pop-ups attack you all the time on the Internet, you most probably have ResultsBay installed on your PC. It is an adware application from the same group as TowerTilt, ScanTack, Laflurla and many other programs. All of them try to promote third-party content with an intention to help their creators make easy money. It is clear that ResultsBay is not a dangerous computer virus. Nevertheless, just like any other adware application, it is associated with specific computer security risks, and you should not ignore them. It is for the best to remove ResultsBay from the PC to avoid any further complications. ResultsBay is developed by SuperWeb LLC. The developer lends its name for the group of adware applications as well. ResultsBay also comes with a homepage at ResultsBay.com. However, if you have ever encountered SuperWeb adware before, you know that there are no direct download links at their homepages. The same applies to ResultsBay as well. Clicking the Download button would only open a new blank tab. With this, we can make only one assumption – ResultsBay is distributed via bundled downloads. It means that if you see this program on your computer, it means there is more than just one potentially unwanted adware application on your system. According to our security research team, ResultsBay ALWAYS comes bundled with other installers and downloaders, such as InstallQ, for example. Thus, users set up this program themselves, even if they are not aware of that. 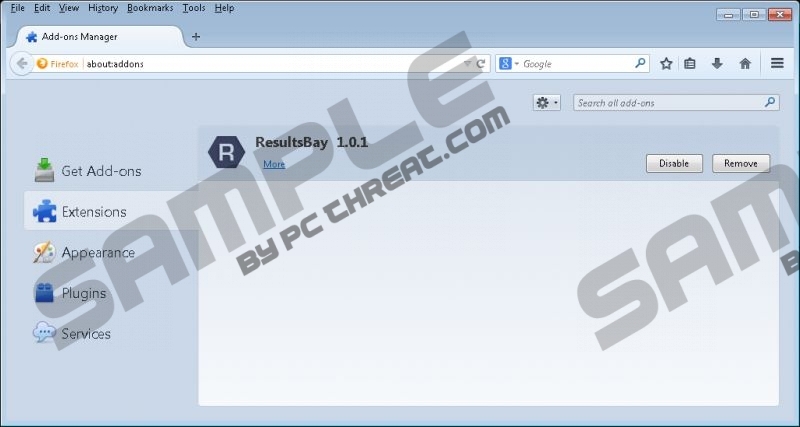 ResultsBay adds extensions to Mozilla Firefox and Internet Explorer web browsers. Although the official homepage claims that Google Chrome is also compatible with ResultsBay, the extension did not match with this browser during our tests. After the installation, ResultsBay begins collecting data on your web browsing habits. When it has enough information, ResultsBay starts displaying banner ads and shopping suggestions on commercial websites (for example, ebay.com, amazon.com, bestbuy.com, etc.). You should not click ResultsBay ads because they are not safe. Some of them may display information on shopping deals with reasonable prices, but the application does not review the ad’s content. It means that cyber criminals could embed potentially corrupted links into ResultsBay ads, and by clicking them you would land on an unfamiliar website. This way you would increase the website’s traffic count, and in the worst case scenario you would be exposed to malware distribution network. Check out the manual removal instructions below and uninstall ResultsBay from your computer. The plugin from Mozilla Firefox browser does not disappear automatically, so you will have to delete it by hand. For other unwanted applications, scan the PC with SpyHunter free scanner, and if manual removal is not possible, acquire a powerful antispyware tool to terminate all the potential threats. Go to Uninstall a program and remove ResultsBay. Select Add or remove programs and uninstall ResultsBay. Quick & tested solution for ResultsBay removal. My problem is I cant find "ResultsBay" in my lists of programs, not on the Uninstall function of Control Panel (I have win 7) or in the IObit Uninaller. I,ve checked the other names like Super Web, Tower Tilt, etc., and have looked at every thing with a recent install date and find nothing. How is it hiding?